Your plane has safely landed, your seatbelt is still fastened, and the announcement of the cabin crew is music to your ears: "Welcome to Paris.“ But this is, unfortunately, the first lie you will be told when arriving in France. You are not in Paris, far from it, you’re in Roissy, a vast desert north east of the capital, a wasteland paved with runways revolving around a metropolis of terminals that is ranked as one of the worst airports in the world year after year: Charles-de-Gaulle – do you really want to leave the plane? Your first impressions will be – sobering. At first sight, it’s an airport like any other. Once outside the aircraft you’ll be taking buses or walkways and stroll endless corridors, you’ll pass through gates (if they’re open and the guy in charge isn’t off for his coffee break). 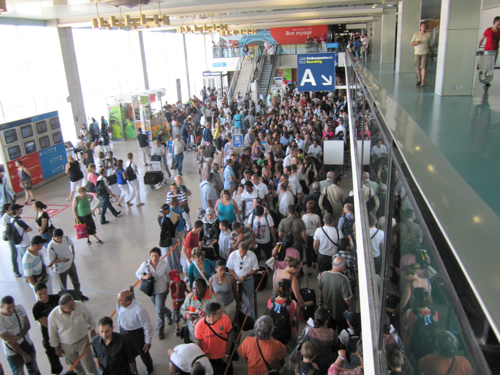 You’ll follow signs leading to the customs, and other signs misleading you to hidden baggage claims and again others falsely pointing to the exit (which is, at Charles-de-Gaulle, always far, far away). Here’s a plan of the whole thing, it’s unreadable, good luck! - Maybe the airport workers are on strike and refuse to open doors. - Maybe the customs people are on strike and their counters are unmanned. - Maybe the transfer desk is on strike causing some hiccups. - Maybe the baggage deliverers are on strike and block any further handling. - Maybe the shopkeepers in the arrival area are on strike and squatting in customs. - Maybe the cleaning personnel are on strike and taking possession of the gates. Whatever the case, remember that it could be worse: the arrival area has been known to be completely sealed off due to yet another terrorist warning, and THEN you’re in real trouble. So relax. And make the best out of it. The only thing you’ll know for sure is that you’ll never know what’s going on. And nobody will ever tell you in Roissy. Non-Europeans – say your prayers! Once the crowd moves again, let’s hope that you are not flying in from Africa. Or from America. Or from Asia. Let’s also hope that you don’t have to go through immigration and that your passport is a European one. It isn’t? And your city of departure lies well beyond European borders? Well, then it’ll be a good idea to call any friends waiting for you and tell them you’ll be late. Because customs at Charles-de-Gaulle is special, you know: they may unload one of these new super-Airbuses with 700 passengers - but there’s only ONE guy sitting at the immigration counter. Why? Only heaven knows. Where’s your baggage? Don’t panic too soon! Charles-de-Gaulle is huge. More than 83 million passengers go through the airport every year (that adds up to an average of almost 230.000 people every day). It’s the biggest passenger hub on the European continent, the second biggest all over the world as well as the world’s biggest cargo airport. Have that in mind during your own odyssey. Your next stop is: the baggage area. Now here’s a tip: first of all, make sure that you’re going to the right place. In some terminals, like 2D, there’s more than one baggage claim and you might find yourself in the wrong one, waiting – totally in vain – for your stuff. Do it like the frequent flyers: watch out for the (small, almost invisible, well-hidden) pink-coloured screens while on your way out. Only THEY indicate where YOUR proper baggage area is to be found. And remember: you’re never in a hurry in Roissy. On the day of your arrival, the baggage guys might neither be on strike nor on their coffee break, yet they still won’t hurry while handling your belongings (why should they?). On paper, everything looks fine: there are coaches, trains, taxis like at every normal airport. But reality differs slightly. To get to the airport train station, you’ll have to take an airport bus. Where to find one? Good question. Let’s say they’re somewhere outside the terminal (not waiting for you). Then there are coaches serving Paris-Opéra directly, yes. But try to find one (same as above: look for them somewhere outside the terminal). There are taxi stations at every terminal (although it can take a while before they actually arrive) and they are even easy to find. Yet if you don’t speak French and look like a tourist, there’s a good chance (50:50) that the driver will get the most out of it and give you a city tour you’ve never asked for. Count around 50 Euros for a taxi ride. Finally, alas...there’s the traffic. Two motorways lead from Roissy to the city, the A-1 and the A-3 (the A-1 is to be preferred, taxi drivers like the A-3 better in order to make more mileage). Both roads are under construction at any given time – and throughout the day you’ll be stuck in enduring traffic jams. But again: you’ve got no choice. Calculate at least one hour to get from the airport into the city, regardless of whether you take a taxi, a train or a bus (add an hour more if you go to the southern arrondissements, add even more time if you come on a bad day with unions parading through the city). Overall, it may sound like a joke but it’s the unfortunate truth: the last leg of your journey to Paris will be the toughest one. Just to give you an example: If you’re flying in from, say, Berlin, you’ll need as much time to get from the German capital to Roissy (900 kilometres, one-and-a-half hours) as you need to go from Roissy to the French capital (25 kilometers). Is it worth it? That’s an easy question: of course it is.